Looking for a fun gift for the guys in your life? 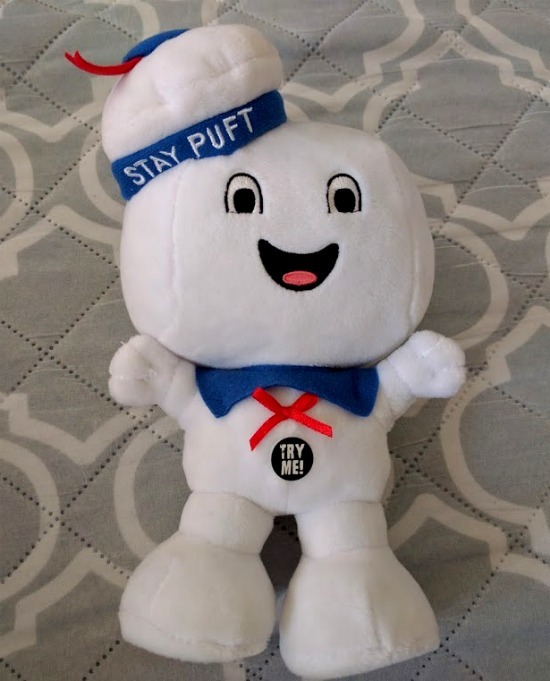 We think this Stay Puft man is pretty cool as ar the other products that Underground Toys has produced as part of their license with the Ghostbusters movie. While honestly I hate feminized movies that are made simply for the fact of making it a "girl thing", these toys are fun and you can just pretend that it's a throw back to the original series if you want when you buy this as a gift for the man in your life! The stuffed collection includes talking, non-talking and mini versions of some of movie fans’ all-time favorite ghosts, Slimer, Stay Puft Marshmallow Man and No Ghost. Slimer, Happy Stay Puft, Angry Stay Puft and Toasted Stay Puft emit either movie-related sounds or the theme song from the movie when their tummies are pressed. The lineup includes medium-sized talking plush, all of which are available at Target and Macy’s stores nationwide. A 12-inch version of all four talking ghosts is available exclusively at Walmart as well. Meanwhile, Barnes & Noble is carrying a 9-inch exclusive of talking Toasted Stay Puft. For those guys who are “Ghostbusters” fans but to enjoy some peace and quiet, Underground Toys is also offering non-talking No Ghost, Angry-Face Stay Puft Marshmallow Man and Slimer. Finally, the Underground Toys “Ghostbuster” plush collection includes Minis for those with limited space around the home or office. Because of their small size, the Minis also make great car decorations and stocking stuffers. The Slimer Mini emits sounds from the movie when pressed while Happy Stay Puft Marshmallow Man, Angry Stay Puft and No Ghost sing the “Ghostbusters” theme song. These products are available at retail nationwide including Target, Walmart and Macy’s, so that should help make your gift shopping for the man in your life a little bit easier this season! Who's Got The Hottest Selling NFL Jersey RIGHT NOW? How Do You Like My New Shades?